Project Gutenberg is best know for digitizing and distributing public domain ebooks, but that's not they do. I was reminded today about PG's self publishing portal, and since it hasn't gotten much attention since it launched I thought it worth another look. This is a rather unusual portal, and it doesn't quite resemble any other free ebook site or ebookstore. Initially launched in July 2012 with around 700 titles, this 18 month old service now boasts 2300 titles which are available to download for free. That's far fewer than the 45 thousand titles available on the main Project Gutenberg site, and that's not the only difference. The only ebook format offered by the self-pub portal is PDF, and the ebooks are still available as free downloads, with some CC licensed titles mixed in. Yes, the only supported format is PDF, and yes, many of the titles are free to download but cannot be shared. I didn't really understand the limitations when this portal launched, and 18 months later I am still baffled. It's almost as if PG started to build a commercial ebookstore for academic titles, and then let the project stall. This would explain the license and format restriction, but it raises questions as to why this is still a free service that doesn't support the formats desired most by users. But in spite of the puzzling details, some authors are finding this portal to be useful. The collection now boasts titles from over 30 languages, including Latin, Japanese, Urdu, and even a couple photo book titles which should not be viewed after a meal. 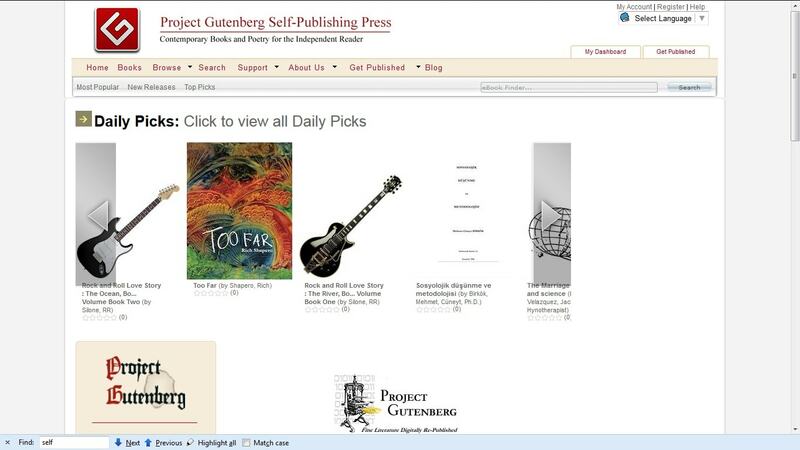 The self-pub portal can be found at self.gutenberg.org. I looked at it several times and I don’t get it either. If I just want to publish a text for free, I can put it on my own website. If I wasn’t willing to pay out of pocket for a website and domain name, I could always use WordPress.com or something. One might say that portals facilitate discovery, but how important is that when you’re not trying to sell? And then there’s the little matter of feeling welcome, which I do on Smashwords for example, but never did over at Project Gutenberg. And then, what’s the point? I’m more paranoid than most, I wouldn’t touch a PDF even if it did come from the source of 98% of all my ebooks. PDFs simply can’t be made 100% safe. And although I have tremendous respect for Gutenberg, I don’t trust their ability to vet the PDFs they handle. Now that’s a point I hadn’t considered. You’re right; this site is not a safe source of PDFs. But I will also note that I have bought DRMed PDFs from legit bookstores; there are some academic titles you can’t find any other way. Just use a non-Adobe reader app (like the awesome & way faster, Foxit Reader) and you eliminate 99% of any possible security issues.